Dana Gioia is an internationally acclaimed and award-winning poet, and the former Chairman of the National Endowment for the Arts who is now the Judge Widney Professor of Poetry and Public Culture at the University of Southern California. He has published several full-length collections of poetry (and several shorter collections), and the collection Interrogations at Noon won the 2002 American Book Award. His poetry has also appeared in numerous anthologies. His 1991 book, Can Poetry Matter?, was a finalist for the National Book Critics Circle award. His poems, translations, essays, and reviews have appeared in many magazines, including The New Yorker, The Atlantic, The Washington Post Book World, The New York Times Book Review, Slate, and The Hudson Review. He is also a member of the College of Fellows at the Dominican School of Philosophy and Theology (Berkeley). In October 2013, I had the pleasure of interviewing Dana and his brother, Ted, about their respective careers as authors, artists, and businessmen. Dana recently corresponded with me about the upcoming three-day conference, “The Future of the Catholic Literary Imagination”, hosted by the Institute for Advanced Catholic Studies at USC, which is headed by Fr. James Heft, that will take place February 19-21 on the USC campus. The conference features presentations by Gioia, Julia Alvarez, Ron Hansen, Alice McDermott, Kevin Starr, and Tobias Wolff, with panelists including many more leading writers, critics, scholars, editors, and journalists. CWR: How did the USC conference on Catholic literature come about? Gioia: As a writer and a Catholic, I’ve been deeply concerned by the retreat of Catholic writers and artists from the cultural mainstream. I’ve also been disappointed by the Church’s lack of concern about the role of the arts, especially in Catholic worship and education. I felt it was the right time to gather our best writers and teacher—both new and established—to discuss the issues. 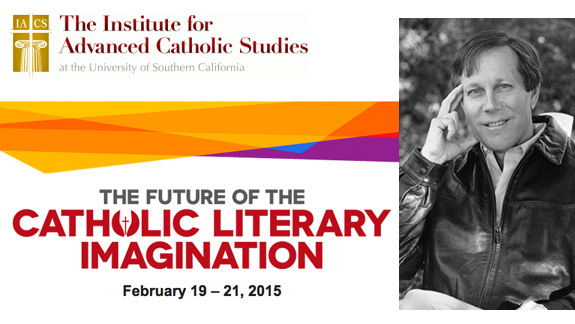 USC’s Institute of Advanced Catholic Studies was the perfect sponsor for the conference. Father James Heft was immediately enthusiastic about the idea. We decided to create a national conference involving our leading writers. CWR: What topics will be addressed and what formats? Gioia: We want the programs at the USC conference to be lively, intelligent, and engaging. That means that we are not presenting formal academic presentations. Instead, we are bringing together best writers and thinkers to have public conversations about important subjects. We will discuss the role of faith in novels and poetry. We will also talk about the challenges young writers face in starting their careers. We believe that the written word is crucially important to how we understand and express the world. When Catholics writers no longer have their voices and stories heard in the world, it diminishes both the Church and literary culture. CWR: What issues face Catholic writers today? Gioia: There are a great many issues, not the least of which is an increased anti-Catholicism in our intellectual and academic culture. Many young Catholic writers feel they need to hide their faith in order to succeed in a militantly secular world. There are too few places for Catholic writers to meet, publish, be reviewed, and lecture. This is an especially huge problem for beginning writers. We need to rebuild Catholic literary culture, which ironically was much stronger 60 years ago than today. The USC conference will create an open and accessible meeting place where writers can converse, listen, and learn. CWR: What are your hopes for what the conference will inspire? Gioia: We are bringing hundreds of writers, teachers, and intellectuals together from around the U.S. and Canada. The sheer creative and intellectual brainpower we’re gathering is enormous. It would be foolhardy to predict the results. What I hope is that each of our literary pilgrims finds something important, something they need. That will mean different things for different people, but the outcomes will certainly include new friends, new contacts, and new opportunities. What’s my hope? It’s to have the USC conference change lives and through that new energy change our culture. That is what art and the spirit should do. • Visit “The Future of the Catholic Literary Imagination” for more information. Should We Hope “That All Men Be Saved”? Eight years ago today: Habemus papam!